Our large scale garage doors include roller, retractable and canopy style garage doors, all of which can be installed as automated with electronic control. Vehicles are significant investments, whether your personal car or a commercial vehicle. Garage doors from Doorcare South West Ltd improve the security of your garage as well as its contents. With optional remote control operation, you can find yourself saving time. The optional insulation improves the environment in your garage and the selection of styles and finishes result in improved aesthetics to your home. Using the same high quality materials and manufacturing techniques used in the construction of our roller shutters or roller garage doors, you can be assured of reliability and safety. Available in a range of colours, our garage doors can be finished to easily matched to the building exterior or made to stand out, depending on your preferences. We offer a range of wooden garage doors which have a lot of appeal due to their appearance and cost, rather than for their strength. There are several types of wood that are excellent for garage doors. Woods such as solid cedar will last for years and look great. The main drawback to a wooden garage door, is that wood needs maintenance over the years to prevent it from warping or cracking. Repainting or reapplying varnish is required every couple of years to wooden garage doors. This keeps them looking fresh and in their best condition. For more information on garage doors, contact our Devon experts. Many people are under the impression that electric garage doors are extremely expensive. However at Doorcare South West Ltd, we have electric garage doors to suit a wide range of budgets. Electric Garage doors can be easily operated by either pressing a hand held remote control transmitter, some allow you to operate from up to 100metres away, so you don't have to get out of your car to open the garage door when it is pouring with rain. There are additional advantages to electric garage doors, in that when the garage door is closed, it is locked and can only be opened by your compact remote transmitter. For more information on the range of stunning garage doors available from Devon based Doorcare South West Ltd, please contact us. To add extra value to your home, then a garage door from our Devon experts is an affordable and reliable way. 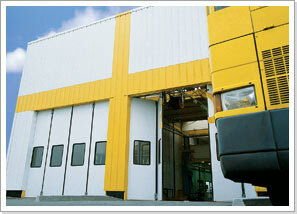 There are several types of garage door. Some of the most common are: retractable, canopy side and hinged sectional garage doors. If you have limited space on your driveway, then one of our sectional garage doors could be the right choice for you. They open and shut vertically, meaning that there is no problem parking right up to the door without keeping it from opening. If you are unsure, contact Doorcare South West, your friendly Devon garage doors experts. Among the wide variety of designs, the most popular garage doors are roller garage doors that are sectional, upward acting and self storing.